The economy finally is bouncing back! Although we may not ever get back to what was considered “normal” before the bubble burst, things do seem to be getting better. Unfortunately, one of the many casualties of the economic crisis was dental health. As folks cut back, reeled in spending and held tight to their budgets, I saw elective dental procedures drop dramatically after 2008. But elective or not, these procedures have drastic effects on quality of life, and I am pleased to see that as the economy betters, people once again are considering their dental care a priority. So how can you achieve the smile you want without breaking the bank? Get regular checkups every six months. 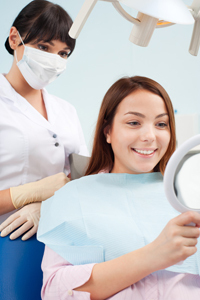 One of the easiest ways to prevent the need for expensive procedures is to go for your dental check up and cleaning every six months. Why? Six months is pretty much the minimum time it takes for a cavity to develop to the point that it’s visible, either in the mouth or on an x-ray. So if we see you every six months, and you develop a cavity, we can now treat that cavity at a very early stage, with minimal discomfort and a very low price tag. Wait until you feel pain, and you’ll likely need a root canal and crown. Suddenly a procedure that should have cost a couple hundred dollars will cost a couple thousand. to return after the insurance has been cancelled and have to foot the bill on their own. Consider financing. 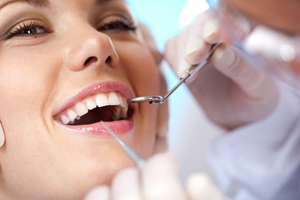 Many dental procedures can be expensive. Financing is a great way to get the treatment you need sooner rather than later. Many third-party financing programs offer zero percent interest financing plans for 12 months or more. A treatment that costs $6,000 may seem out of reach, but spread that out into 12 monthly payments and suddenly it becomes possible. Most dental offices offer these third party plans nowadays. They don’t want to deal with the hassles of collections. Invest in yourself. Often we see people who are ready to spend thousands of dollars on a flat screen TV or a car but not on their dental health. It’s unfortunate, as investing in a healthy smile will affect all aspects of your life. Without a full-set of healthy teeth, it becomes difficult to maintain a healthy diet, leading to problems with weight, cholesterol,blood pressure and a host of other issues. A nice smile can change a person who normally is socially outgoing, and make them embarrassed and reserved. This can lead to fewer job opportunities and problems with personal relationships. I have had countless patients in sales tell me how restoring their smile has made a huge difference at work. can restore all the missing teeth for a lower overall fee, however, they will never be as ideal of a solution as the implants. They should be thought of as a temporary fix until you are able to afford the more comprehensive treatment. Always take a team approach to dental care. Ask plenty of questions when you are given a treatment plan. Is this the most ideal treatment for me? Why? Are there alternatives to this treatment? Finally, you should understand what happens if you choose to do nothing. In the end, that is always an option, but I have found that the patients who initially choose to avoid treatment do so only because they either don’t have an understanding of the consequences, they are afraid, or they have a financial barrier. Once we clear through those concerns, most people are ready to move forward in restoring their teeth so they can achieve the healthy beautiful smile they deserve.